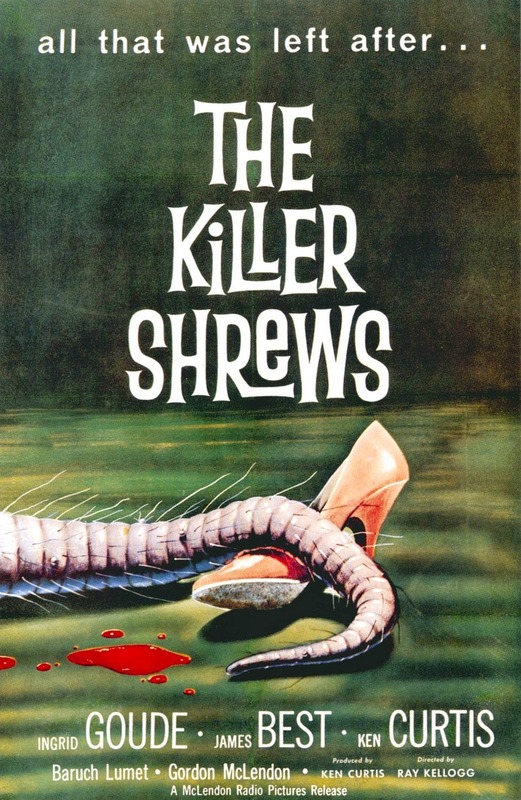 Tag line: "Your skin will crawl with fear at their nearness"
Ok, we’ll get this out of the way right up front: the title creatures in 1959’s The Killer Shrews aren’t the least bit convincing. Using dogs dressed up like rats to portray the over-sized beasts, the shrews will likely evoke more laughter than screams from an audience. Take them out of the equation, though, and The Killer Shrews isn’t a bad little movie. While on his way to deliver food to a team of scientists on a remote island, Ship’s Captain Thorne Sherman (James Best) realizes a hurricane is bearing down on the area. Figuring the storm will make landfall later that night, he and his first mate, Griswold (Judge Henry Dupree), decide to wait it out before heading home. With Griswold staying behind to keep an eye on the boat, Capt. Sherman is invited to spend the night at the laboratory of noted scientist Dr. Marlowe Cragis (Baruch Lumet), who, along with his daughter Ann (Ingrid Goude), her fiancé Jerry (Ken Curtis), and research assistants Radford Baines (Gordon McClendon) and Mario (Alfred DeSoto), has been working on a way to end world hunger. Unfortunately, his experiments had one very unusual side effect: they’ve transformed the island’s shrew population into ravenous monsters! James Best does an adequate job as the film’s heroic leading man, but what carries The Killer Shrews early on is the tension generated by Dr Cragis and his crew as they tell Capt. Sherman all about the horrible beasts they’ve inadvertently created. These Shrews even caused Ann to call off her engagement to Jerry (one night when they were being attacked, Jerry got so scared that he pushed Ann out of the way and ran for safety), and an attempt to poison them also failed miserably (the shrews took the poison, but instead of it killing them, it remained in their system, making their bite not only painful, but deadly as well). Of course, the suspense fizzles out once we actually see the shrews (I have no idea how those costumes didn’t fall off when the dogs were running through the woods), leading me to wonder how much better the movie might have been if we never saw the damn things. For most fans of this sort of film, the thought of not seeing the monster probably isn’t an appealing one, but in the case of The Killer Shrews, it would've been a welcome alternative. James Best also starred in the sequel 'Return of the Killer Shrews' which was released last year. The shrews look a little better in the sequel since they are CGI but I still enjoy the original for what it was. and I also have "Tarantula" on my list to watch. Any recommendations of similar movies that are worth checking out would be greatly appreciated. And thanks for the review, it's always a fun surprise to see what you'll come up with next!